This is my most loved book of the moment. 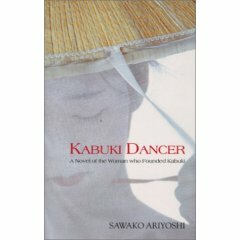 'Kabuki Dancer' by Sawako Ariyoshi. Its the story of a troupe of Kabuki performers in 16th century Japan. Im in love with Okuni, the heroine! Its one of those books i dont read TOO fast beacause i know ill be sad to reach the end. Its ever so beautiful. Geisha asobi Blogged before but such a favourite!